The Uva Wellassa region where thousands of our forefathers laid down their lives for the liberation of the country from the clutches of British imperialism is slowly emerging from centuries of poverty with greater attention paid by the government for its development. The entire Uva Wellassa region which was subject to an ethnic pogrom at the hands of British imperialists in the aftermath of the Wellassa rebellion received less attention from the colonial powers and successive Anglophile leaders in the country. For this reason, the Uva Province, particularly the Moneragala district remained below the poverty line for years, though the area once fed the nation. 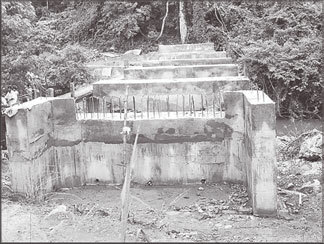 The British rulers massacred thousands of Sinhala youth and a mass exodus of people continued from the area as the irrigation tanks and the property of the people were destroyed by the British rulers after the 1818 rebellion. 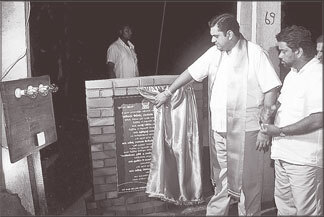 After President Mahinda Rajapaksa assumed office in 2005, the Uva Wellassa region had been witnessing the rays of development. A number of projects have been launched in almost all Grama Seva Niladhari Divisions, with billions of rupees spent. All major towns in the province, including Badalkumbura, Moneragala, Sellakataragama and Bibile are being developed with funds allocated by the Uva Provincial Council and the Central Government. The government led by President Mahinda Rajapaksa launched a number of electrification projects in the Moneragala district. Only 45 percent houses in the area had electricity in 2005, and the entire district will receive electricity by 2013. Over 84 percent of households in the Moneragala district have received electricity under the Uva Udanaya programme which is the brainchild of Uva Province Chief Minister Shashendra Rajapaksa. A bridge connecting five villages in the Badalkumbura Divisional Secretariat is being built at Megahayaya costing over Rs. 40 million. This new bridge being built across the Menik Ganga is a boon to the people, as they can easily transport their produce to the market and have easy access to other areas. The Badalkumbura town is also being developed by the Uva Provincial Council spending a sum of over Rs. 997 million. This project will also ease the heavy traffic congestion in the heart of the Badalkumbura town. Former Badalkumbura Pradeshiya Sabha Chairman Samarasinghe Abeysekera said the government has been investing billions of rupees in infrastructure development in the Moneragala district, particularly the Badalkumbura Pradeshiya Sabha area. Abeysekera said most of the roads which come under the Pradeshiya Sabha and Provincial Council purview have been fully renovated while many such projects are in the pipeline. He said funds have been allocated to develop the Badakumbura national school too. “A new police station is being built in the heart of the Badalkumura town”, he said. 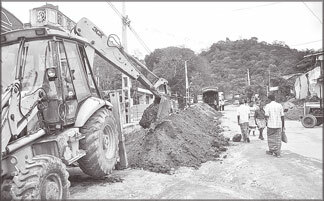 Abeysekera said that there were mixed reaction from businessmen when the road network in the town was widened. “Later they understood that this move would boost their businesses too and whole heartedly supported the government’s move”, he said. He said the government has also allocated funds for the Millaoya water supply scheme, under which over 25,000 families in the Badalkumbura Divisional Secretariat division would benefit. This project started in 1998, but was abandoned for lack of necessary funds. However, plans are afoot to revive the project under the direction of Uva Province Chief Minister Shashendra Rajapaksa. This project will be funded by the government of Israel, he said.